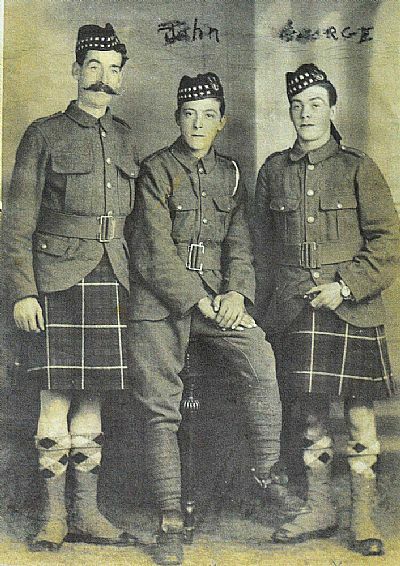 John (centre in photo) and George Hossack (right) from Rosemarkie served in the Seaforths. John was killed in November 1917 at Cambrai and his body was never found. Below is a poem written by John's mother on the anniversary of his death. Photo courtesy of Billy and Alastair Hossack. A memory that time will ne’er efface. But now alas no more we’ll see his face. And in the doing he gave his noble life. Unheeding all the turmoil and the strife. A humble member of the Seaforth Clan. Are proud to know he proved himself a man. And picture in our thoughts a soldier’s grave. Beneath he soil you gave your life to save. To fate’s decree now sadly humbly bow. But that which God ordains is right we know.